"Inside the head of a lifestyle-cruiser" - light stories about this and that. My grandfathers grandfather was Carl August Lindblom, one of the best known musicians in middle Sweden between 1850 and 1880. His son Malkus Lindblom emigrated to Finland in 1880, which is why most of my relatives, myself included happen to live in Finland. A couple of weeks ago we organised a gathering in Rejmyre, Sweden, which was Malkus’s last residence in Sweden before his emigration. One of the high lights of the gathering was a performance by four Swedish traditional musicians, who played music by Carl August and told us stories about him. The piece on the following video is the finishing number of the concert: March number 31 by Carl August Lindblom. 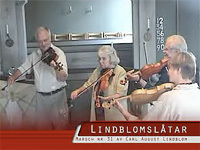 The musicians are Arne Blomberg, Margareta Höglund, Brita Ehlert and Kurt Ehlert. Best album of all times? These days there has been (again) a poll: name the world's best music album of all times. 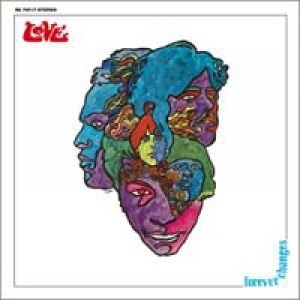 My vote goes to “Forever Changes” from 1967, by the group Love. Actually Love was an Arthur Lee vehicle. He was the leader and main song writer. The band had several good albums but Forever Changes is brilliant. I first bought it on vinyl in England in 1968 and later in the 90’s as a CD. Unfortunately it is seldom played on the radio and I guess it is one of the most under-rated albums of all times. In my online-blog I have submitted a link to YouTube for one of the tracks of this album but, unfortunately, with the offline-blog version this is not possible. In an attempt to educate and amuse my cruising friends all over the world I sometimes write posts on Finnish events. A couple of weeks ago I wrote my first bit about bizarre Finnish sporting events, and I didn’t even mention the obvious one: who can withstand a hot sauna the longest. Yesterday the annual World Sauna Championships in Finland ended with the death of one of the finalists, a Russian. The other finalist, a Finn who has won the last 5 World Championships , was taken to hospital after collapsing. The Russian (left) and Finnish defending world champion. All competitors need to sign in to the competition with a doctor’s certificate. At the start the temperature is 110C. Then half a litre of water is poured on the stove every 30 seconds, last man in the sauna is champion. The championships have been held in Heinola (138km north of Helsinki) since 1999. According to the organisers there will be no more championships in the future – this was the last time. However, I do not believe that the sauna championships are over. The Finns are unable to resist these kind of events and the sauna is almost a national symbol. Until somebody starts the World Sauna Championships again, we have to make do with other crazy “sports”, why not try the sitting naked on an ant’s nest? The tropical weather in Finland this summer is astonishing. After my previous log post we were hit by a second storm. The first one was called Asta and a few days later arrived Veera. And a third one is predicted to hit the republic in a couple of days. 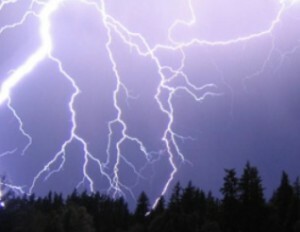 The Finnish Meteorological Institute reports that there was 23,000 cloud-to-earth lightnings during the Veera-storm. They have some kind of lightning detector network for counting. This number of lightnings is not unique, but extremely rare. During the past 19 years we have been cruising almost all over the tropics aboard Scorpio. Avoiding certain areas when they are potentially exposed to tropical storms, hurricanes, cyclones, taifuns etc. has been our main guide-line when planning our routes. 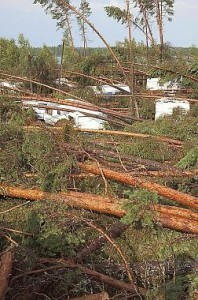 Look at the photo above, it is of a camper field in Pirkanmaa, Finland, where 50 of 100 camper wagons were completely destroyed. The destruction is quite similar to what we have been used to see in photos from marinas in places like like the Caribbean and Florida after a hurricane has passed. In Florida, however, people should know from experience that those disasters occur every now and then. 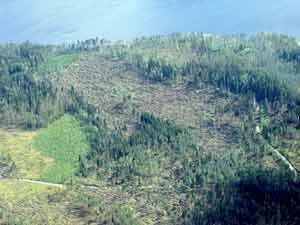 The folks in the forests of Finland were taken by complete surprise – this was unthinkable. On the chart above you can see the path of the two storms, Asta and Veera. Asta hit from the southeast and passed very close to our summer place (between Mikkeli and Imatra on the map), but we didn’t have any problems. Just a few days later Veera-storm entered from the southwest and crossed the country in a northeasterly direction. It is interesting that the traffic on our web site trippled after my previous blog. Apparently these climate issues are fascinating. On 3rd August, when my previous post was published we had 3 times the normal traffic on this site. Tropical Finland - a Bear Market? 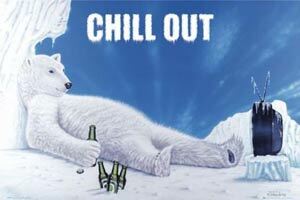 Sometimes when abroad we hear stories of polar bears roaming the streets in Finland. There's no truth in these tales of course, but the winters can be very cold indeed. Last winter's lowest temperature was below -40C (-40F). This is why we prefer to spend our winters in the tropics, where we have gotten accustomed to temperatures around 40C (104F) - a difference of 80C (176F)! The lowest temperature we had any night aboard Scorpio in South East Asia was 29C (84.2F). This summer the weather has been extraordinary warm and dry in Finland. Because of the low humidity we have found it very pleasant although some people complain that it has been too hot. Maybe our blood has thinned after more than a decade in the tropics. 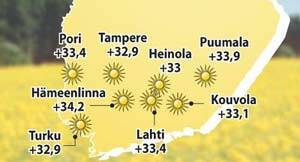 Our summer place is located in Puumala, which was on average the warmest spot in the country, with several days of highest-recorded temperatures, around 33C (91.4F). 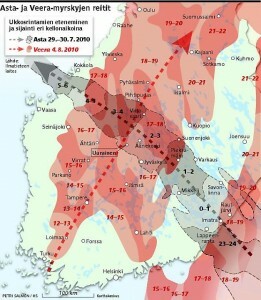 An all time high of 37.2C (99F) was recorded in Liperi not far away (as a comparison, the all time low 51.5C (-60.7F) was recorded in northern Finland in 1999). We found 27C in the water, which is almost the same as in Thailand were we last went swimming from the yacht. Also the tropical storms seem to be heading this way now. A week ago a violent windstorm, blowing up to 30m/s (almost 60 knots), produced by a band of fast-moving thunderstorms, crossed the country causing devastating damages, chopping thousands of hectares of forest, that crushed houses and cars and broke power-lines, leaving tens of thousands of homes without electricity, water and phone connections. It isn't just the weather that has been exotic. The wildlife has been exiting too. 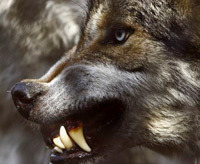 There has ben several cases with wolf packs killing dozens of sheep even in densely populated areas in southwestern Finland. In the north and along the Russian border there has been several sightings of bears, although not polar bears. Yesterday radio programs were interrupted by an announcement from the police: People in and around Rovaniemi, the largest city in northern Finland, was warned that a bear had been sighted and people were advised to stay inside. 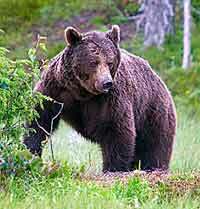 The bear is ever present in Finland, however, and in many ways. 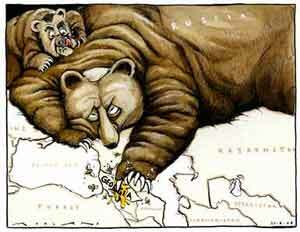 The Russian Bear is a national personification for Russia, used in cartoons and articles at least since the 17th century, usually in a less flattering context - often implying that Russia is "big, brutal and clumsy". Finland has several hundred years of unhappy experiences from her big neighbour. 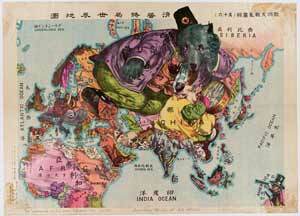 A cartoon, illustrating the world around 1900. Finland itself, in it's coat of arms, is illustrated as a lion defending the West against the East. The right forepaw is replaced with an armoured hand brandishing a (western, straight) sword, while trampling on an (oriental, crescent shaped) saber with the hind-paws. During this long hot summer we have been refreshing ourselves with larger quantities than usual of my favourite beverage, beer. 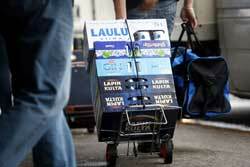 One of the most popular beers is called Karhu, which is Finnish for bear. This fact brings us back to the polar bear, or actually the Polar Beer, which we found in an unlikely place, namely Venezuela - a rather tropical country as well. The beer market for the thirsty in southern Finland has long been Tallin in Estonia, only a couple of hour's ferry ride away. With Estonia's entry in the European Union and increase of their economy the difference in prices is decreasing, but is still substantial if you are buying quantities. It is common to go there to stock up with beer and booze ahead of weddings and other big parties. 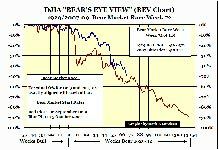 The word Bear Market, of course, has little to do with the mammal or the beer, and is usually used to describe a general decline in the stock market over a period of time. 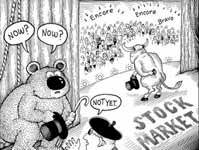 Let's hope that the most recent bear market, that started in late 2007 is now behind us. The beer market is doing well, however. This year we are enjoying a longer than usual vacation away from messing about in a sailing yacht in the Tropics. We have the good fortune to spend 5 months in Finland. The Nordic weather is presently showing it’s best face, with temperatures rising to 34C in the air and 26C below the surface. Finland has a glorious past in the world of sports, with probably more olympic medals per capita than any other nation. Unfortunately those days are long gone now, the only events where Finland can expect to succeed, on a good day, is the javelin in athletics, and occasionally perhaps also in some sailing events. In order to remedy this decline the Finns have invented some bizarre sports where they can excel. As an example, we have swamp soccer. The exotic sport of Swamp Soccer originated in the swamps of Finland. 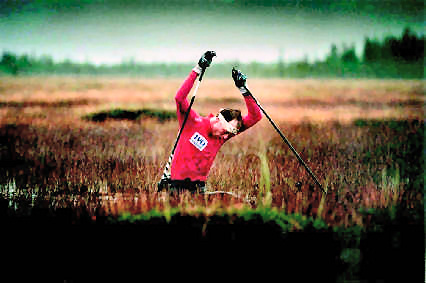 It was started by some cross country skiers who were training in the swamps during the summer months. One of them was Olympic gold medallist Mika Myllylä, seen in the photo below. Finland held its first tournament in 1997 with 13 teams. Held every year, this competition was upgraded in 2000 to the World Championships. Now this event has become a massive football competition with over 300 teams registered for the 2010 World Championships, taking place this week-end at Hyrynsalmi 600km north of Helsinki. As an off-shot of swamp soccer, the Deep Snow Soccer Championship, is held every winter in the same place. I will try to explain some of these activities in a later post. I check my junk-mailbox regularly (even the old, almost obsolete Hotmail-one), because sometimes important non-spam ends up there. Recently a mail TO ME from the Secretary General of the United Nations ended up in the trash. The subject line was: “United Nations Compensation Unit, To scam victims”! I did not open this mail. A magnitude 7.5 earthquake struck under the sea bed in the Nicobar islands, causing tremors that were felt a thousand kilometres away on the Indian mainland, where many were shaken awake in the dead of the night causing some to flee their homes in panic. 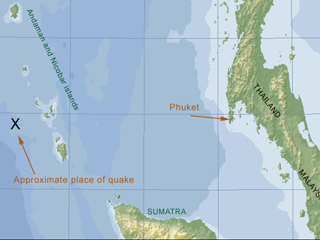 The quake hit early Sunday morning local time, with the epicentre less than 350 nautical miles from Phuket in Thailand. Our yacht Scorpio is presently in Phuket, but fortunately hauled out high on dry land. I am in Finland myself, trying to check various sources on the internet to determine the risk for tsunamis in the area. The Pacific Tsunami Center in Hawai and the Indian Ocean Information Centre have issued tsunami warnings and watches, but the alerts were later cancelled. Only a mild surge in sea levels of around 50 centimetres were expected. This area was badly hit by the 2004 tsunami which was triggered by an earth quake off Sumatra and sent giant waves crushing across the region. 220,000 people were killed, most of them in the Indonesian province of Aceh on Sumatra. Thousands were killed also in Sri Lanka, India, Myanmar and Thailand. The Andaman Sea witnesses frequent earthquakes caused by the meeting of the Indian tectonic plate with the Burmese micro plate along an area known as the Andaman Trench. We haven't been very lucky with the changings of the currency rate during the past decade. Our floating home has been located in maybe 20 different countries during this financially turbulent period and we have undertaken some pretty costly boat work. Usually there has always been an unfavourable change in the exchange rates whenever we spend more local currency than normal. Our currency is the Euro. The value of the Euro compared to Thailand Baht (6/09-05/10). Click on chart for a larger copy. Source: www.xe.com. Half a year ago (November 2009) we arrived in Thailand and decided to undertake some major repairs and face lifts on our yacht. Now, in May 2010, when the work is under way and the invoices are dropping in, the value of Euro in Thailand Baht has dropped by 20% (even before the Greek problem hit the news, the drop was 15%). If the grand total value of our projects is, say 700.000 THB, our costs have increased by 3,500 Euros. Bad timing, wrong time and wrong place. Unfortunately there's not much we can do about it. With hind sight somebody could say: Hey, why didn't you terminate the amount in November? Well, we were not committed to all the projects until we had found the right contractors and agreed on prices, and by then we were already in April when the Greek problem suddenly hit the fan. Who would buy a large amount of Thailand Bahts just for speculation? Anyway, we have seen this phenomenon before during our voyage. Most countries in the Americas either use US dollars or their currency is linked to the dollar. We spent several years in Central and South America, the Caribbean and on the US east coast from 2000 to 2005. We had particularly expensive boat work done in 2002 and 2003, when the value of one Euro was around 0.85 US cents. After those years, the situation became the reverse and you could buy more than 1.5 US for a single Euro. However, by then we had moved to areas outside the USD-world and had little gain because of the strengthening of the Euro. Instead, during the time when we spent around 50,000 New Zealand dollars on boat work in 2007, the value of the Euro decreased by 20% compared to the NZD. Same stories, different currency, tough luck - this is cruising.